Welcome to South Dearborn High School! Success Driven. Prepare to Achieve. Welcome to South Dearborn High School! With just over 900 students in grades 9-12, we offer an environment where students are challenged with rigorous academic curriculums that prepare them for what comes next in their life – be it college or a career. The Pathways to Success program provides for student pathways in vocational programming, College Core classes, and even an Associate's degree through the partnership with Ivy Tech. In fact, South Dearborn High School received an B as its final letter grade for school accountability in 2015-2016. With numerous dual credit course options, project based learning courses, and three different types of diploma tracks there are truly opportunities for every student to succeed. 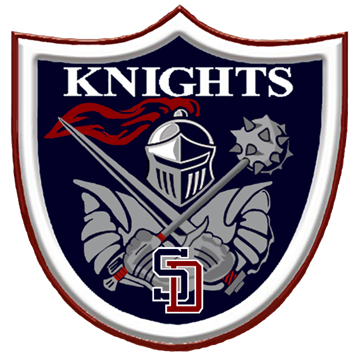 Welcome to South Dearborn High School, home of the Knights! At SDHS, our teachers and staff take great pride in providing an outstanding, well-rounded educational experience. We strive to be a leader in 21st Century education, our faculty and staff are dedicated to meeting the individual needs of all students challenging our high achievers and supporting those that struggle. Today’s world requires that students be skilled in the use of technology as an educational tool, while at the same time able to perform with more traditional resources. South Dearborn High School is a 1:1 environment, providing Chromebooks for every student. Instructors will utilize these devices and other materials to create a blended learning environment founded on Indiana Academic Standards. Our academic offerings provide students with access to a wide variety of modern curriculum. Through our Pathways to Success: College and Career Prep students will have the opportunity to experience the rigors of college coursework, earning college credit and potentially completing an Associate’s degree while still in high school. For our students interested in pursuing immediate access to the workforce we offer vocational and career training culminating in workplace certifications. Through rigorous academic experiences and supporting relationships, students are prepared for the challenges of tomorrow. Thank you for your support and encouragement, the 2017-2018 school year will be a great one! With leadership from Superintendent Mr. Eric Lows, the South Dearborn Community School Corporation educators are energized to continue raising the bar in education. Our administrators lead the strategic vision for the school and determine our overarching curriculum. We are fortunate to have such a strong leadership team at the helm at SDHS, and throughout the South Dearborn Community School Corporation. Our school administrators work closely together to ensure your child's educational experience is an exceptional from their first day of Kindergarten through their last day of high school.